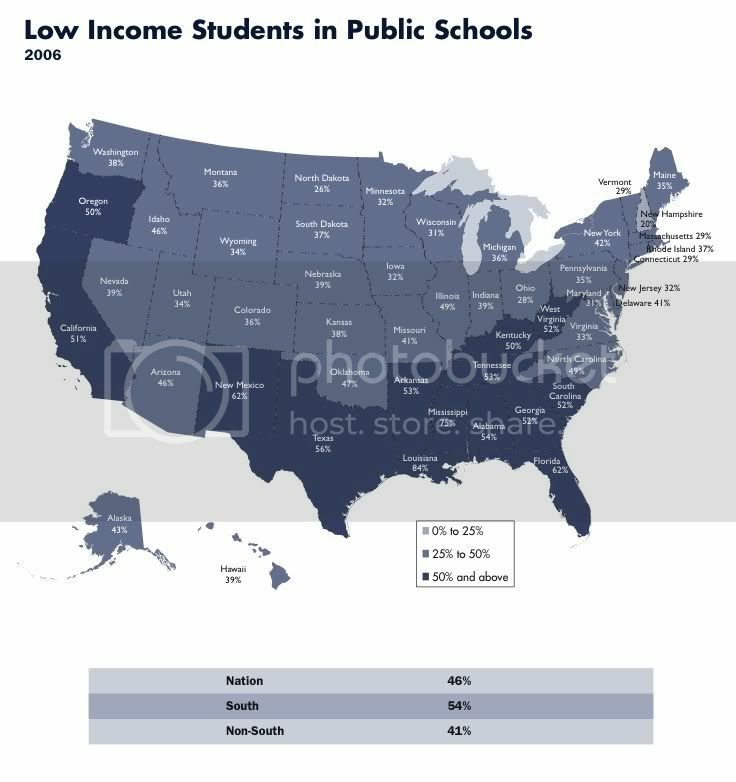 For the first time in more than four decades, the South* is the only region in the country where low-income children make up a majority -- 54 percent -- of public school students. That has critical implications for the South's future, since low-income students as a group lag behind their wealthier peers by most measures of educational progress. These are among the alarming findings of a new report from the Southern Education Foundation, an Atlanta-based nonprofit that promotes excellence in education. Titled "A New Majority: Low Income Students in the South's Public Schools," the report was issued in honor of SEF's 140th anniversary. The report attributes the disturbing trend to several factors. Demographically, many Southern states are experiencing a higher rate of population growth among Latino and African American children, who are statistically more likely than white children to be born into low-income households. Economically, many Southern states are struggling with high rates of underemployment and unemployment due to the outsourcing of good jobs to cheaper foreign labor markets. And historically, the Deep South and Southern Appalachia have experienced persistently high poverty rates. The South's challenges are made even greater by the fact that Southern states provide the least educational resources to their low income students. The South has the lowest per pupil expenditures in the nation. In 2000, for example, Mississippi's highest per pupil expenditures did not even match many states' lowest student expenditure. That year, public school districts in Mississippi with the state's highest per pupil expenditures spent less per child than school districts in more than 20 other states spent in their lowest per pupil expenditures. Also, the South provides the nation's smallest amounts of need-based aid to assist the low income students who do graduate from high school and have a chance to attend college. As the report concludes, how Southern states address this new majority in public school classrooms is the most important challenge the region -- and perhaps the nation -- will face this century. * SEF defines the South much as we at the Institute do (Alabama, Arkansas, Florida, Georgia, Kentucky, Louisiana, Mississippi, North Carolina, South Carolina, Tennessee, Texas, Virginia and West Virginia), but unlike us it also counts Maryland and Oklahoma.